Giving players the chance to plunder the loot of the game’s title character, Goblin’s Cave is an innovatively themed and uniquely formatted three reel, three row and three payline slot. 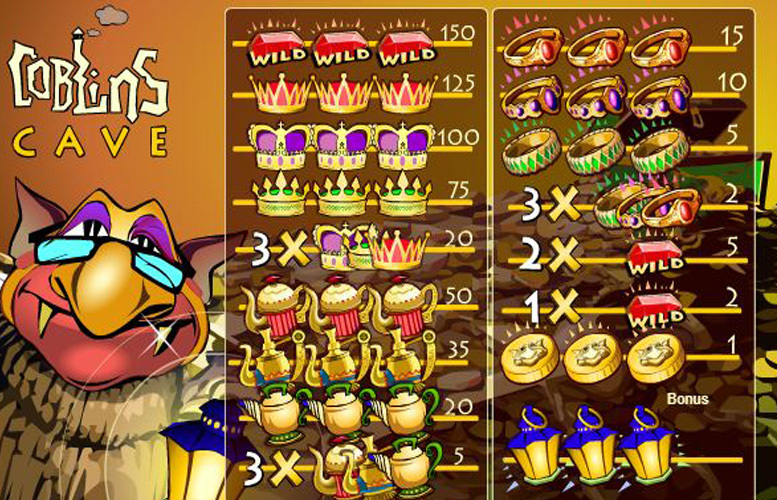 Falling between the traditional three reel, Vegas style slots and the more common five reel alternatives, Goblin’s Cave is quite a simple slot but does still jazz up its gameplay with wild substitutions and a bonus round. 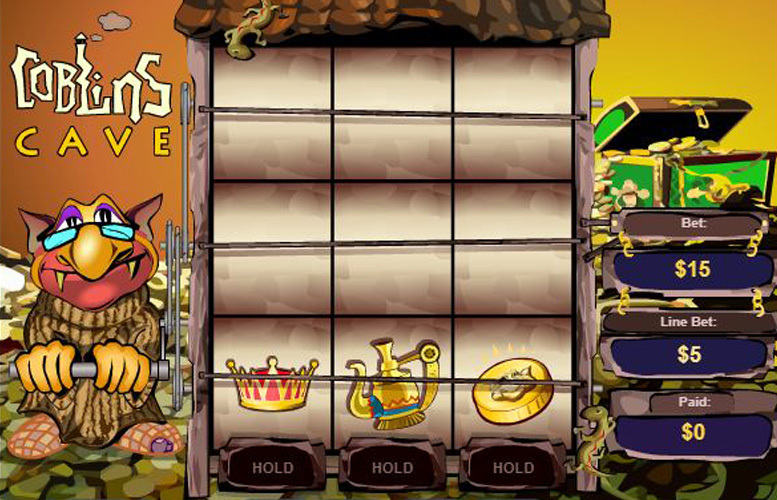 As simple to play as traditional Vegas slots, Goblin’s Cave introduces multiple paylines, wilds and a bonus round, which are features normally associated with five reel games. As well as making gameplay more immersive, the aforementioned features also boost the Goblin’s Cave winning potential. The slot’s theme is simple and unique, and can’t help but put a smile on the face. Payline jackpots available through Goblin’s Cave are relatively small, with the top jackpot totalling only £750. Staking options, too, are comparatively limited. The minimum bet per spin is £3 and the maximum is just £15. Possessing three paylines which are all always active, the top Goblin’s Cave jackpots are generally achieved when three matching symbols line up from left to right along one of those paylines. As in many slots, the most valuable combination of all is one comprising three of the game’s wild symbols. The Goblin’s Cave wild symbols depict an image of a red gemstone and the word ‘Wild’, and pay out at a rate of 150 times the line bet if three appear along an active payline. With a maximum possible line bet of £5, therefore, the top jackpot can be worth a total of £750. Most three reel slots are disappointingly lacking in additional features. Goblin’s Cave, however, fortunately bucks that trend and includes wild substitutions and a bonus round as part of its gameplay. We’ve already talked about the Goblin’s Cave wild symbol and how it can trigger the slot’s top payline jackpot. The red gemstone symbols, however, also enacts wild substitutions whereby it can stand for all other symbols in order to make up the most valuable possible combination according to the other symbols present on the reels. If three of the bonus symbols, depicting a blue lantern, appear along one of the Goblin’s Cave paylines it triggers the slot’s bonus round. The lanterns allow a player to head deeper into the cave, where they can select from choice of treasure chests and will receive the prize amount revealed by opening that chest. All of the symbols on the Goblin’s Cave reels show off images of trinkets and treasures found in the lair of the game’s title character. Behind the wild, which we have already explained makes up the slot’s most valuable payline combination, the next best symbols are those depicting different varieties of crown. If three of the red crown symbols line up along a payline from left to right, the resulting jackpot will be worth 125 times the line bet. Three of the purple crowns similarly arranged, meanwhile, pays out at a rate of 100 times the line bet. A three green crown symbol combination will deliver a payout worth 75 times the line bet. Finally, if three of any of the crowns appear in combination along a payline, it triggers a jackpot worth 20 times the line bet. The staking options provided to Goblin’s Cave players, in terms of how much they can wager per spin, are comparatively limited. In fact, players have only five different options in total, due to the fact that the number of active paylines cannot be altered. As three paylines are always active, therefore, choosing between a line bet of either £1, £2, £3, £4 or £5 is the only option a player is afforded. Overall, then, stake amounts per spin of £3, £6, £9, £12 and £15 are the available alternatives. Goblin’s Cave is a slot game which in many ways manages to combine the strengths and minimise the weakness of both traditional Vegas style three reel slots and more modern five reel games. The slot is incredibly easy to understand and to play, just like a traditional three reel alternative, and relies upon smaller but more regular payouts to achieve its theoretical return to player percentage of between 94.5% and 95.70%. More akin to five reel slots, however, Goblin’s Cave also introduces wild symbols to boost the winning potential of each spin and a bonus round to give players an additional way to win. Goblin’s Cave isn’t without its weaknesses, however, with a very limited range of staking options likely to disappoint some players. That limited and comparatively low range of options, too, means that payline jackpots are generally quite small. This game has a rating of 4 / 5 with 417 total reviews by the users.